One of the most anticipated games of 2011 for Kinect. Winner of 9 awards at E3 for innovative graphics, music, and gameplay. 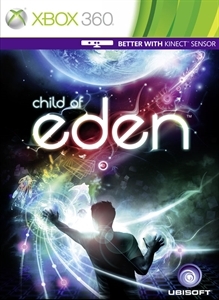 Child of Eden is the “multi-sensory shooter” that will send players diving into a visual matrix of synchronized music and mind-blowing visuals. It will usher forth yet another landmark game experience from the mind of renowned game designer Tetsuya Mizuguchi.